Looking forward to the mill's appearance on BBC Countryfile on Easter Sunday. BBC1 at 7pm. Hot-cross buns are available from the mill and farmers' markets throughout Lent. FREE admission to the mill museum on Saturday mornings and Sunday afternoons for the whole of 2019. We've been able to source some great quality organic oats and are now busy rolling them to make rolled oats for all our porridge, muesli and flapjack loving customers! Thank you for all your lovely reviews on TripAdvisor! We can now accept debit/credit card payments in the mill. Looking for a different sort of gift? 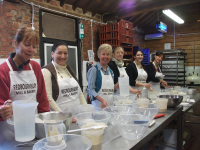 A voucher for one of our very popular baking classes makes a great present! Baking classes run on selected Mondays.